Waiting for Ofsted was pitched to me by a teacher, which marks a first for me in terms of my reviewing career. I was a little reluctant to go along, initially — I’ve been in enough school shows to know what they’re usually like; some half-baked Shakespeare, or a spotty-faced Arthur Miller adaptation. The Westcliff boys, however, presented me with neither. What I ended up seeing was an amalgamation of Beckett’s Waiting for Godot and a healthy serving of English private-school surrealism, a la Monty Python’s Flying Circus. This was an ambitious undertaking, especially since the cast only had a week’s rehearsal. Waiting for Ofsted’s greatest strength is its commitment to surrealism. There are long, uncomfortable silences, some playful use of bananas and movement sequences that subvert the setting of the piece, transcending school drama and taking the audience for a conceptual spin. These same sequences, however, served to drain energy from the piece in the long run, as Westcliff’s younger actors seemed less than committed to their choreographed movements. They did, however, only learn them in a week, which is pretty extraordinary. Voice work was consistently solid (served well by the well-spoken student body of Westcliff.) Particular commendation must be afforded to the pieces “Headmaster,” who dominates, in terms of stage presence, from the very outset. The more peculiar elements of the piece are carried off with aplomb, considering the age of these performers ranges from the dawn of double digits to mid-adolescence, by my suspicion. These did serve to bewilder the audience — nobody really expects to go to a school play and meet with the nebulous weirdness of Beckett. It was a nice touch. The reason I did go to see Waiting for Ofsted is simple. Westcliff, at present, doesn’t have a drama department. 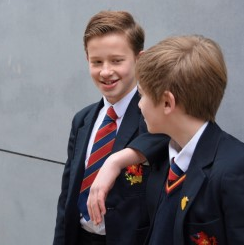 The school’s lack of emphasis on the theatre becomes palpably obvious at the end of the piece; I saw Waiting for Ofsted on A-level results day. Every boy who had undertaken their A levels had managed to secure a place at their chosen University, which was nice to see, but I was a little disheartened to hear that only one had any inkling of an artistic future in mind. And he was the sound tech. Westcliff High isn’t exactly under-funded, so I find it baffling that they don’t offer Drama as a core subject, opting instead to encourage a solely extra-curricular engagement with dramatic performance. If you can afford to send your pupils off to Iceland, and you’re willing to encourage them to join the cadets, I’d suggest you afford Drama the same courtesy. A Mr Jeffreys, who orchestrated Waiting for Ofsted, shares my opinion. I personally spent the majority of my higher education devoid of curricular Drama, and I feel I suffered for it. I feel the same way about Waiting for Ofsted — the boys’ lack of training is apparent. Its impressive, granted, to tackle Beckett in your teens (or even beforehand,) but to pull it off, you need a guiding hand. As such, I implore the staff at Westcliff to consider the addition of Drama to their syllabus— I am absolutely sure there are boys at your school who’s passion for Acting goes beyond an elective interest. “Westcliff will always indulge,” reads the school website. Indulge me then. Waiting for Ofsted has finished its run at the Edinburgh Fringe, but the promise for more from the Westcliff boys is an enticing prospect. They’re keen, intelligent young performers— all they need is a little guidance from say, a Drama teacher.